When NASA's New Horizons spacecraft passed Pluto in July 2015, she took this picture of the great mountain ranges, where she encounters a vast icy plain called Sputnik Planitia. The crests on these photos have now been identified as dunes of solid methane grains. 4th July at intervals of approximately 14 minutes. The first image was taken about 25,000 kilometers from Pluto, and the second was taken when the spacecraft was 10,000 kilometers (about 17,000 kilometers) away. Break your 3-D glasses for the best view. The New Horizons team discovered a chain of exotic mountains covered in methane snow on Pluto. NASA released a picture of the snow-capped mountains stretching across the dark expanses of Cthulhu on March 3rd. NASA published a photo on February 4, 2015, which is believed to be a picture of a floating hill on Pluto's surface. The hills are made of water ice and float over a sea of ​​nitrogen. This image, taken in infrared light, shows that water ice is plentiful on Pluto's surface. The image was taken with two Plutos made by the New Horizons probe on July 14, when the probe was located about 108,000 kilometers above Pluto. These photos show Pluto's different textures, including what NASA calls "rounded and bizarrely structured mountains". The mountains are informally referred to as Tartarus Dorsa. This picture shows about 530 kilometers from Pluto's terrain. It combines blue, red and infrared images taken with the spacecraft's Ralph / Multispectral Visual Imaging Camera. The pictures were taken on the 14th of July during the flyby of the probe. They were released on September 24th. The photos taken by New Horizons shortly before his closest approach to Pluto on July 14 are the sharpest images yet to present Pluto's varied terrain. This high resolution image shows details of two icebergs. The image stretches over 120 kilometers from Pluto's surface. This image of Pluto's surface was taken just 15 minutes after NASA's New Horizon spacecraft made its closest approach to the icy planet on July 14. In the Pluto sun, the spacecraft's camera took more than one Dozens of thin haze layers, at least 100 kilometers above the surface. The photo was connected to Earth on September 13th. This image of Pluto's icy and mountainous landscapes was taken from a distance of 11,000 miles (17,700 kilometers). "In this picture, you really feel at Pluto and see the landscape for yourself," said Alan Stern of the New Horizons Investigator of the Southwest Research Institute in Colorado. This image is a synthesis of new high-resolution images of New Horizons degraded. The wide icy plains were called Sputnik Planum. This image is from a perspective above the equatorial area of ​​Pluto. Over the Labor Day weekend, September 5-7, astronomers launched a spacecraft dump. Scientists say that mountains that look like mountains could be huge blocks of frozen water suspended in frozen nitrogen. The new photos, taken on July 14th and released on September 10th, have a pixel 400 meters (440 yards). New Horizons' next pass at Pluto was about 50,000 miles from the surface. Pluto's landscape is very varied: plains, mountains, craters and what looks like they could be dunes. The smallest details in the photos are about half a mile wide. The area with the craters is ancient, scientists say. The smooth frozen planes are relatively young. Immediately before their next approach to Pluto on July 14, NASA's New Horizons spacecraft fired this photograph of Charon, Pluto's largest moon. The photo was taken at a distance of 290,000 miles. Charon's North Pole region is clearly dark. This photo was posted on September 10th. This new image of Pluto impresses planetary scientists. It shows the atmosphere of the small world, illuminated by the sun. NASA says the picture reveals haze layers that are many times higher than predicted. The photo was taken by the spaceship New Horizons seven hours after his next approach to Pluto on July 14th. New Horizons was about 1.25 million miles from Pluto at the time. Images of Pluto's heart-shaped trait, informally called the Tombaugh Regio, reveal a "vast, crater-less plain that is apparently no more than 100 million years old," NASA said on July 17. The frozen region "may still be shaped by geological processes." Launched in 2006, NASA's New Horizons probe has traveled 3 billion miles to the dwarf planet. Close-up of a region near the equator of Pluto revealed a huge surprise: a series of youthful mountains. NASA published the picture on July 15. This July 15 picture unveils remarkable new details of Pluto's largest moon, Charon. 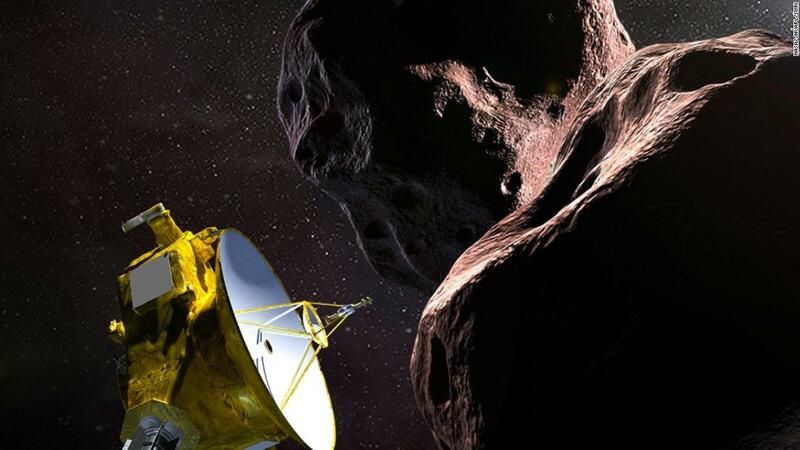 The latest spectral analysis of the New Horizons Ralph instrument was released on July 15. It shows an abundance of methane ice, but with striking differences from place to place on the frozen surface of Pluto. NASA team members and guests count until Pluto approaches the spacecraft on July 14th. This image of Pluto was taken by New Horizons on July 13, about 16 hours before the closest approach. The spacecraft was 476,000 miles from Pluto's surface. The colors in this image of Pluto and Charon are exaggerated in order to clearly recognize the different characteristics of the figure. (These are not the actual colors of Pluto and Charon, and the two bodies are not really close together.) This picture was taken on July 13, the day before New Horizons Pluto came closest. This image of Pluto was taken by New Horizons on July 12th. The spacecraft was 1.6 million miles from Pluto at this time. New Horizons photographed this photo by Charon on July 12th. It shows a system of chasms larger than the Grand Canyon. The spacecraft was 1.6 million miles away when the picture was taken. New Horizons was about 3.7 million miles from Pluto and Charon when this picture was taken on July 8th. Do you see a heart on Pluto? This image was taken by New Horizons on July 7, when it was about 5 million miles from the planet. Look down to the right, and you will see a large light area with a diameter of 1,200 miles that resembles a heart. New Horizons made six black and white photos of Pluto and Charon between June 23rd and 29th. The images were combined with color data from another space probe instrument to produce the above images. The spacecraft was 15 million miles away when it started the sequence, and 11 million miles when the last photo was taken. Pluto is shown here together with Charon in pictures from the 25th and 27th of June. The picture on the right shows a series of evenly spaced dark spots near the equator of Pluto. Scientists hope to solve the puzzle when New Horizons approaches Pluto. New Horizons released a series of 13 paintings by Charon in April, circling Pluto over a period of 6½ days. When the pictures were taken, the spacecraft moved from about 69 million miles from Pluto to 64 million miles. Take a close look at the pictures above: They mark for the first time that New Horizons has photographed the smallest and weakest moons of Pluto, Kerberos and Styx. The pictures were taken from April 25th to May 1st. New Horizons used his color imager to capture this image of Pluto and Charon on April 9. This, according to NASA, was the first color image taken by a spaceship approaching Pluto and Charon. The spaceship was about 71 million miles from Pluto when the photo was taken. In August 2014, New Horizons crossed the orbit of Neptune, the last planet it would pass on its journey to Pluto. New Horizons took this photo of Neptune and its big moon Triton when it was about 2.45 billion miles from the planet – more than 26 times the distance between Earth and our Sun. New Horizons has taken this picture of Jupiter and its volcano Moon Io early 2007. On the way to Pluto, New Horizons shot these photos of Jupiter's four great "Galilean" moons. From the left are Io, Europe, Ganymede and Callisto. A white arrow points to Pluto in this photo taken in September 2006 by New Horizons. The spacecraft was still about 2.6 billion kilometers from Pluto. Pluto was discovered in 1930, but was only a spot of light in Earth's best telescopes until NASA published this photograph in February 2010. It was created by combining several images of the Hubble Space Telescope – each only a few pixels wide – by a technique called dithering. NASA says it took four years and 20 computers took a long time to create the image. This was one of the best views we had before the New Horizons mission of Pluto and his moon Charon. The picture was taken on 21 February 1994 by the European Space Agency's weak object camera on the Hubble Space Telescope. A Hubble space telescope from Pluto and its moons. Charon is the largest moon near Pluto. The other four bright spots are smaller moons discovered in 2005, 2011, and 2012: Nix, Hydra, Kerberos, and Styx. New Horizons launched January 19, 2006 from the Kennedy Space Center in Florida. The probe was about the size of a piano, weighing nearly 1,054 pounds at launch. On board are seven instruments to take pictures and test the atmosphere of Pluto. After completing his five-month study on Pluto, the spaceship will continue to penetrate into the Kuiper Belt.